Please contact us now for your copy. We are selling these books on special while stocks last. A Big Hello and Welcome to all Schmidt family members and friends from Paul, Copland and Peter Schmidt. As most of you know our fabulous reunion and book launch took place in September 2012 and we have provided full details and lots of photographs on the 'book launch' tab above. There is lots to see and enjoy, so please sit back and have a good time browsing our new updated website. We have now added a 'NEWS' tab (above) to the site which will bring you any updates on what is happening with our family history. In this edition you will read about some great book donations the family has made to a variety of institutions. If you have any news let us know and we will try to add it to the site as soon as possible. PLEASE DON'T DELAY IN GETTING YOUR ORDER TO US. Although we cannot be certain we believe that this publication is one of the largest family histories ever published in Australia. 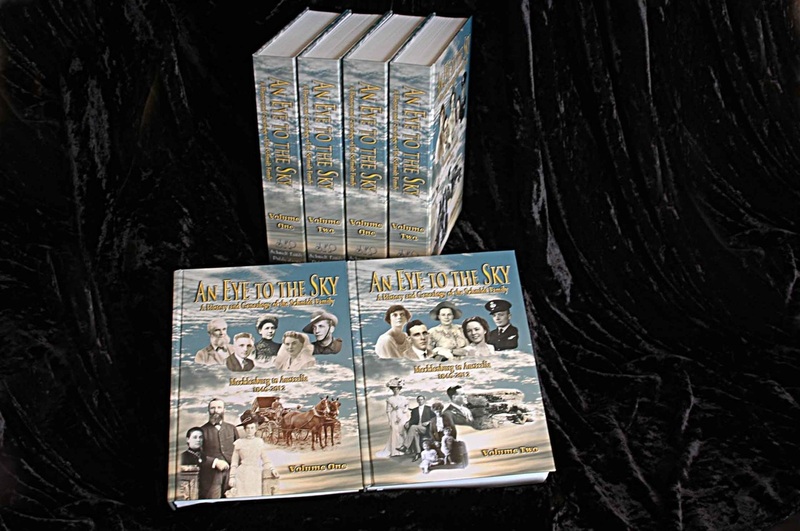 Where most family histories run to about 50,000 or 60,000 words with a hundred or so photographs, An Eye to the Sky is approximately 725,000 words and includes about 800 wonderful photographs. The Schmidt family originated at Mecklenberg, Germany, coming principally from the regions of Jürgenshagen, Kröpelin and Schmadebeck. A total of just eleven members of the family emigrated to Australia over a period of several years during the 1840s and 1850s. From the moment of their arrival in Australia the various Schmidt family members began to prosper quite rapidly. Those Schmidt pioneers soon made an impression on the land, taking up farming holdings, both small and large, in a variety of Australian colonies. Most of these were successful, some spectacularly so, although the years of struggle and hardship were endemic to all. In some cases such as J.C.H. ‘Henry’ Schmidt, who formed the genesis of Goolburra station near Cunnamulla, Queensland, during the early 1890s, the success was enormous. Henry’s pastoral empire and the empires of his sons and daughters form a major part of this publication. Their holdings, their vast cattle and sheep enterprises in Queensland and the Northern Territory have become legendary in terms of Australian pastoral history and one of his sons, Dolf, and also a grandson, Trevor, became the general superintendents in control of that historic and vast cattle business enterprise, the Australian Agricultural Company, founded by Royal Charter during Australia’s formative years. Over the years the family has owned and operated a large number of major pastoral enterprises, some of them iconic Australian properties such as the vast Alroy Downs in the Northern Territory, Dalmore Downs, Bowen Downs, Rockhampton Downs and even the legendary Nappe Merrie station in the Channel Country where the well known 'Dig' tree of Burke and Wills fame is located. Other important Australian pastoral holdings owned by members of the Schmidt family have included: South Galway; Boothulla; Baroona; Goolburra; Victo; Burrenbella; Charlotte Vale; Clifton; Bando; Alawoona; Ardrossan and the massive Esmeralda station in northern Queensland. To purchase copies of the twin-volume set please contact Paul, Copland or Peter Schmidt by email through the ‘Contact Us’ tab above. Be a part of our heritage, be a part of us. Support the family history project by purchasing as many books as you can. Buy one for yourselves, one for each of your children and grandchildren, give one to your local library and museum so that our family history is remembered and treasured forever. Give one to a special friend for a birthday or Christmas. Once the print-run has been sold these books will be very rare so keep a couple of copies in a cupboard to sell to others at a later date. Please copy the web address below and send it to everyone in your family and ask them to do the same. We need to get the message out there that the most amazing family history ever published in Australia has now been released. Paul, Copland and Peter Schmidt.